Camomile - Scented Plant which grows on Scilly. Camper Cuttle - North of Deep Point, St Mary's. Camper Dizzle - Rocks west St Agnes, slightly north of Long Point. Canteen, The - Local name for the New Inn Tresco. Carns & Cairns - A 'Carn' is a rocky outcrop. (Old spelling Karn) Note: A 'Cairn' is an ancient grave site. Carn Friars - Farm on St Mary's. Carn Friars Lane - St Mary's. Carn Morval, Battery, North-west St Mary's - SV 906 119. Civil War gun battery. Built to defend St Mary's Pool. [sah37]. Cassiterides - Ancient name for the tin islands where the Phoenicians obtained their tin. It was once thought that they may refer to the Isles of Scilly but this is no longer widely accepted because there are so few tin deposits. However the islands probably played a significant role in the trading of metals like tin from Cornwall. Castle Bryher - Impressive rocks south-west Bryher. Castle of Bryher - Cromwell's Castle as describes by Duke Cosmo. Castle Ennor Old Town, St Mary's - SV 914 103. C.1244. Described by Leland as "meatley strong pile" in 1536. Details in [sah38]. Most of the stone was used to build the Star Castle. Castle-Rocks/Castle-Rock Well  map. Field system 726, north Old town Bay. Caterpillar's - Generic name once given to the men of Tresco. Channel Pilot - Pilots who would board a ship off Scilly and pilot her to her destination. e.g. UK ports like Cardiff, Glasgow, Liverpool & London. European ports like Antwerp, Copenhagen, Oslo & Rotterdam. Chapel Down Statue - A carving of a human face on top of a pillar in granite was rediscovered in 1989. It is estimated to be over 3000 years old, one of the oldest in Great Britain. [san28] Replica in the IOS Museum. Chapel Down Signal Station - One of many set up during the Napoleonic Wars. Information was sent from the station to naval vessels waiting offshore. The messages were sent in code using a flag, pendant, and four canvas bells. The St Martin's station was in use from 1810 to 1814. SV 942 158. Details in [sah,28]. Charming Molly - Portland Stone Brig wrecked at 'Stoneship Porth' Bryher in 1780. [snt,10,p18]. Charity Schools - Set up c. 1747 by a Godolphin. Chauffer - Name for the basket originally used to contain the coal fire which lit the St Agnes Light-house. Currently in Tresco Gardens. Children's Sculpture - Tresco Gardens, Tresco Abbey. Chipping - Is a process of cutting bulbs to increase their rate of multiplication. Used at Trenoweth. 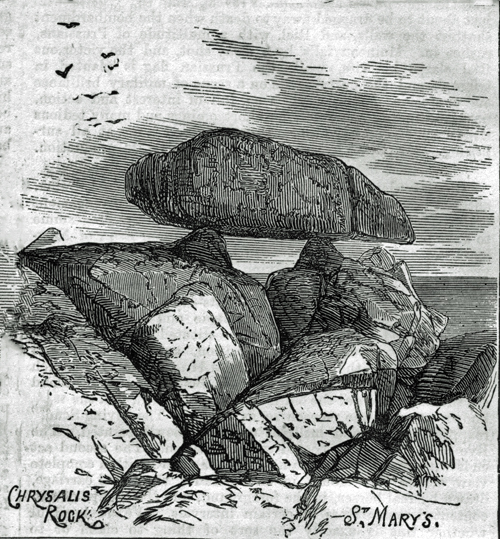 Chrysalis Rock - Recorded in the Illustrated London News. Whereabouts unknown. Left: Sketch of Chrysalis Rock in the Illustrated London News printed in 1874. Chudleigh, Captain Herbert - Born 8th June on Tresco, a famous Scilly sea captain. [snt,10, p24-25]. Church Quay, Bryher - High water quay, mid east coast of Bryher. Church Point - To west of Church Porth. Church Ledges - South of Church Point. Cistern - Water tank. There are two extremely rare lead cisterns outside the St Mary's Parish Church. City, The - Legendary assemblage of Lyonesse houses near the Seven Stones. Cliff Castle - A fortified promontory, defended on three sides by steep cliffs and across its neck by banks or walls that, in some cases, have ditches on their landward sides. There are three in the Isles of Scilly: St Mary's near Old Town; North Bryher, at Shipman Head & St Martins. Iron Age. Coastguard Tower - Junction Telegraph Road & Pungies Lane. Coate, Miss - Author, Cornwall in the Civil War c. 1646. Coleshills - A family recorded as having held the Captaincy of Scilly. Collins, Captain Grenville - Cartographer/Hydrographer to the King who produced one of the most important and reasonably reliable charts of the Isles of Scilly. It formed part of the first edition of The Coasting Pilot in 1693. Cornish Stile - Slated granite to entrap cattle. See Details of these stiles on Scilly. Corsican Tower, Garrison, St Mary's Camp Site. Built as a watch tower c. 1803 during the Napoleonic War. Currently holiday accommodation. Council of Twelve - Probably a later development from when Ralph Blanchminster obligations extended to the preservation of the peace by twelve armed men c. 1290. Not required during the periods of military control but certainly reintroduced by Francis Godolphin c. 1660. Lasted till its dissolution in 1807. Prior to 1783 the twelve were often related to those whom they tried to control, this could have positive and negative results. Positive because of being the same flesh and blood they may have a better understanding of circumstances and difficulties, and negative, when it came to imposing the penalties agreed in law. In 1783 Francis Lord Godolphin dissolved the current twelve "on account of their not duly administering justice according to their oath and not punishing all offenders without partiality and for encouraging vice instead of preventing it". From 1783 to 1807 the 'Twelve' were of wider experience in both learning and administration. Court Leet - A court held periodically in a lordship or manor, before the lord or his steward. Many with regard to petty offences and civil affairs of the district. Courtney, J. S. - Noted as writing the first Scilly guide-book in 1845. Covean - Cafe on St Agnes. Cowrie, Artic - Trivia arctica , Beach Shell. Cowrie, European - Trivia monacha, Beach Shell. Crake-Dew [1909 Spelling] Carreg-Dhu [Modern Spelling] - An old 'Ram' quarry turned into a communal garden. Just off the Telegraph Road towards Longstone Heritage Centre. Creeb (Northwest St Mary's) - Headland between Halangy Porth & Toll's Porth. The Little Creeb is the next headland north just below Halangy Point. Cromwell, Oliver - Of Civil War fame. Crudge, John - Deputy Governor of Scilly c.1680. Responsible for building the Customs House on Scilly. Crudge, William - Son of John above. Commissary of Musters c. 1730. Culvar Hole (St Martin's) - Small Cave. Cupressus macrocarpa - It is a medium-sized evergreen tree, which often becomes irregular and flat-topped as a result of the strong winds that are typical of Scilly. It grows to heights of around 10-25 m, and its trunk diameter reaches 0.6 m, rarely up to 1 m or more. The foliage grows in dense sprays, bright green in colour. The leaves are scale-like, 2-5 mm long, and produced on rounded (not flattened) shoots; seedlings up to a year old have needle-like leaves 4-8 mm long. The seed cones are globose to oblong, 20-40 mm long, with 6-14 scales, green at first, maturing brown about 20-24 months after pollination. The pollen cones are 3-5 mm long, and release their pollen in late winter or early spring. Custom's House (Hugh Street) c. 1842 becomes an annex to the Atlantic Hotel in 1929.